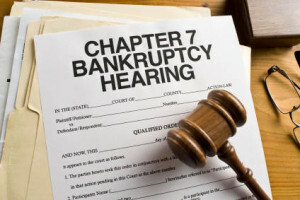 How does the bankruptcy court determine if you are eligible for a Chapter 7 Bankruptcy? The court uses the “means test,” which determines if your income is low enough to qualify. The means test uses a formula designed to keep filers with higher incomes who can repay some of their debts (and through a Chapter 13 Bankruptcy) from filing a Chapter 7 Bankruptcy. But even with some income, you may still qualify. How does the means test work? It subtracts specific monthly expenses from your current monthly income (using your average income over the previous six months before filing). Your attorney will also know about and subtract items like high mortgage payments, car payments, past taxes and other expenses. The income you have left after subtracting out any debt is your disposable income. The higher your disposable income, the less likely you’ll be able to file a Chapter 7 bankruptcy. Remember, only bankruptcy filers with primarily consumer debts, not business debts, need to take the means test. Means test eligibility is based on your income compared to the median income for a household of your size, in the county you live in, within New York State. If your income falls below the median, you qualify for a Chapter 7. If you have questions, please contact me. My fees for a Chapter 7 Bankruptcy are among the lowest you’ll find at $999.